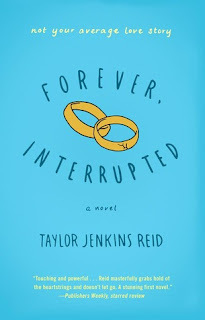 Forever Interrupted resided in my to be read pile for months. I was about to be married when this gem arrived in the mail and I immediately slotted it to the bottom of the pile. I wasn’t ready. And it took me a few months after my wedding day to finally pick it up. It was time. I’d had months to brace myself and I thought I could finally deal. 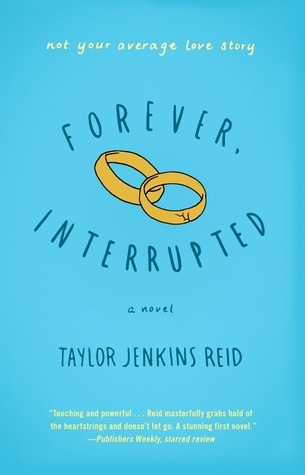 Forever Interrupted is a tough, emotional read, but is absolutely fabulous and worth every word – and the tears they instigate. There is no faffing about with this novel. We are thrown into the action immediately with Ben’s tragic accident only a few short pages into the book. I was immediately drawn into the world of Elsie and Ben and felt her gut wrenching response from the initial fear wandering the streets, to the denial in the hospital and, finally, the agonizing pain and grief. Ben and Elsie are adorable in the way new love struck couples are. We see them come together during flashbacks that are mingled in between the heavier moments following Ben’s accident. The levity of these memories and the couple’s newfound, albeit brief, love, is juxtaposed against the tragic conclusion to their relationship. These memories make the story both lighter with their humour and love, yet also magnifies Elsie’s grief. I loved all the characters. Okay, most of them – Elsie’s parents were a piece of work. But Elsie, Ben, Ben’s mother, and Elsie’s best friend were all great characters. I adored watching the prickly relationship between Elsie and Ben’s mother blossom and turn tender. I absolutely loved this aspect of the story, even more than the flashbacks about Elsie and Ben. How the two women in Ben’s life eventually bond and draw strength from each other is magnificent. I will admit that Ben did drive me somewhat crazy surrounding why he never informed his mother about his relationship with Elsie. But if that hadn’t happened we wouldn’t have had the wonderful story between the two women. I thought an interesting take-away from this novel was how presumptuous some people in Elsie’s life were regarding just how much grief she was allowed with such a short relationship. I stopped to think about it a few times. Yes, she hadn’t been together with Ben for years and years, so maybe his absence wasn’t quite the same as losing someone after decades. But then again, when enveloped in the honeymoon stage, as Ben and Elsie were, I couldn’t imagine the love of my life being torn from my life. The grief portrayed in Forever Interrupted is palpable and heart-wrenching. My heart ached during much of this novel. The grief and anguish portrayed is incredibly realistic. Pick this one up if you’re looking for a fantastic read.